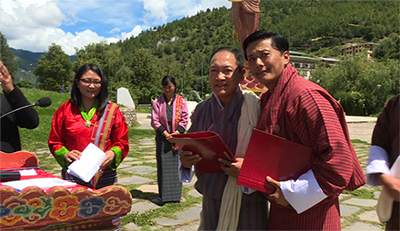 Wangsel Institute in Paro signed a Memorandum of Understanding (MoU) with the Bhutan Tourism Corporation Limited (BTCL). The MoU is aimed at supporting the institute’s photography project for its students with hearing impairment. It was signed at the closing of the Young Photographers’ Project in Thimphu yesterday. The photography project provides the hearing impaired students an opportunity to learn professional photography skills. Under the MoU signed yesterday, the students will receive opportunities for on-the-job trainings, internships and employment. The students will also get to go to Thailand for a workshop on photography. There, they will get opportunities to meet and interact with Thai students with hearing impairment. “We would like to invite 15 students and 3 teachers of Wangsel Institute to Thailand,” Somyos from the Anusarn Sunthorn School for the Deaf. 40 students from Wangsel Institute received lessons and trainings on photography under this year’s Young Photographers’ Project. The training saw the students being taught by professional photographers and writers from Thailand. One of the students, Tenzin Dralha, sees photography as a career opportunity. “In the future, if I don’t get an opportunity to go to a college, I can pursue a career in photography,” he said. Another student, Dechen Pem, has already made up her mind. She wants to be a photographer. “I gained many skills and visited many beautiful places in the last three days,” she said. Young Photographer’s Project helps the students with hearing impairment to build their confidence. It lets them see the world through the lens of the camera, which enables them to gain different life perspectives. As the three-day training ended yesterday, the students displayed some of their best shots at the centenary park.